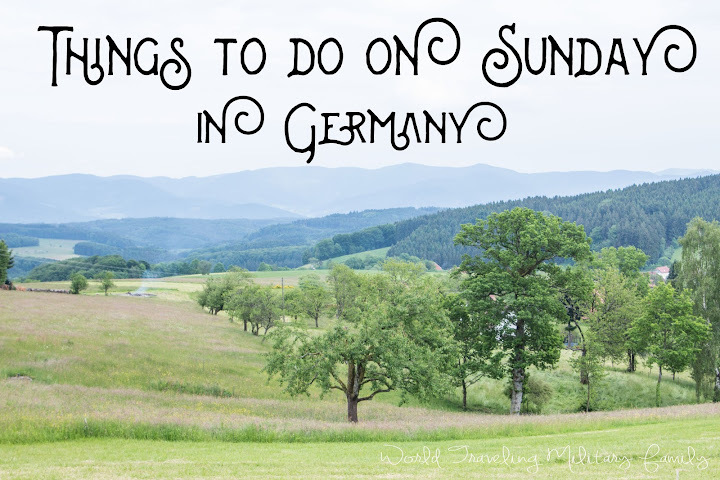 Things to do on Sunday in Germany! There are many people who think that because the Germans take Sunday off there is not much to do, but there are still many Things to do on Sunday in Germany. I wanted to share a few as well as some suggestions of local places near Spangdahlem & Ramstein to try it out. I also kept the list to locations inside of Germany as many people arrive here before they have gotten their tourists passports so this list can get you out traveling within Germany until you can get a tourist passport. Also this list can easily be expanded upon but it give you a starting point for generating ideas for Sunday adventures. Festivals – there are festivals year round! Some popular ones are the Christmas Market in Dudeldorf in Dec, Wittlich Pig Festival in August, Easter Festival in Sankt Wendel in Mar/April, and many more! Hiking Paths – Manderschied, Devil’s Canyon, or any of the many hiking paths that you can find in nearly every village! Pools – Cascades (year round), during warmer months (May-Sept) the outdoor pools: Freibad Kyllburg & Vitelliusbad Wittlich. Outdoor Playgrounds – Castle Playground or one of the many playgrounds/parks you can find all over Germany. River cruises – Mosel River cruise from Bernkastle area, Rhine River cruise to see lots of castles, daily in peak season. Flohmarkts – watch for signs for local flohmakrts, Speicher does one on Sundays a few times a year. Barefoot Parks – Bad Soberhiem – tons of fun for the family & cheap as well! Seasonal – open in the warmer months. Black Forest area – Dorothee’s Glass Blowing Hut, Cuckoo Clocks, Triberg Waterfall – lots to do on Sunday in this area! Amusement parks – Phantasialand in Cologne & Europa Park near the Black Forest area. I hope this gives you some fun suggestions to get out and explore on Sundays! Any other places you like to go on Sundays?